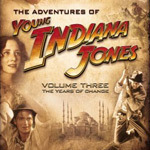 The Young Indiana Jones Chronicles conclude with yet another incredibly comprehensive set, this time 10 discs of adventure, romance, and fascinating history. Ernest Hemingway, Edith Wharton, George Gershwin, and John Ford are only a tiny sampling of the real-life personalities Indy encounters before heading off to college and the archaeological studies that launch his legendary career. 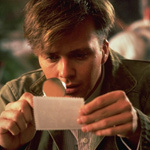 Volume Three starts with Indy (Sean Patrick Flanery, Lone Hero) back on the Italian battlefields of World War I, this time sporting an eye patch and a one-armed man uniform. While in one of the world’s most romantic countries, naturally Indy falls in love (yet again). This time, the object of his heart’s desire is the sweet, beautiful Giulietta. Alas, as is always the case, there’s competition. Taking the advice of another soldier, Ernest Hemingway (Jay Underwood, Uncle Buck), pursues the fair maiden by outdoing his romantic nemesis at every opportunity. The gifts and dates grow increasingly gratuitous and then everything falls to pieces as the competition spirals humorously out of control. Well, even through their rivalry, Indy gives Ernie a great idea for a book title (A Farewell to Arms) and Ernie gets the 227 shrapnel wounds that lead to his medal of honor. It might sound like Ernie gets everything he wants. Well, neither of them get the girl. Losing out on love, Indy moves on to travel through Morocco with Edith Wharton, formerly Edith Jones. Yes, she would be of the one and same Jones family after whom, as legend has it, the expression “keeping up with the Joneses” got its inspiration. Edith and Indy chat about what makes people fall in love with the wrong people and she admires his passion. It’s an interesting relationship that carries an interesting undercurrent of extremely discreet sexual tension between the young Indy and much older Edith. During their travels they stumble on an ambitious reporter named Lowell Thomas who’s looking to land a story about a man named Thomas Edward Lawrence. That would be Indy’s good friend Ned. All of that happens on Disc 1, Tales of Innocence. With a number of intriguing missions and fantastic adventures already behind him as a result of his early travels in Egypt and his days on the battlefields, at first blush Volume Three, which ultimately takes Indy back to the United States for the final three adventures, would seem to be saddled with nothing but leftovers and far less intense subject matter. Jazz takes center stage? Come on! Where’s the adventure in that? Indy works on a Broadway show? Hmmmmph. Well, as noted often in the reviews of Volume One and Volume Two, the beauty of this incredible series is that it does take the time to cover a broad range of topics and, in a fairly deft fashion for a TV series, meld them with colorful back stories, history, and people. Similar to the absurdly remarkable misadventure Indy shares with Franz Kafka in Prague back in Volume Two, this collection sports another tale that goes far off the beaten path. This time, Indy treks all the way out to Transylvania on a search and rescue mission for three soldiers after a figner, an eye, and ear show up in a box. That ominous discovery pays off later when it turns out their captor is none other than a modern day Vlad the Impaler, known more famously in pop culture as Dracula and the owners of those body parts show up for dinner. That episode, Masks of Evil, also includes a very noir adventure in Istanbul, in which Indy takes on the alias of Mr. Anderson, a Swedish journalist who believes the most important thing is to always tell the truth... unless you’re a spy, in which case you really, really can’t. That would be Disc 2. Following those adventures, a totally different tone awaits in Treasure of the Peacock’s Eye, which starts with the end of World War I and the beginning of a classic treasure hunt for Indy and his ol’ war pal, Remy (Ronny Coutteure, Carnaval). Indy’s back in familiar turf as that famous red line crosses the map from England to Egypt, where Indy is reunited with Howard Carter and meets E.M. Forster in Alexandria, then moves on to… Well, thanks to some pirates, Indy and Remy get lost before washing ashore at the feet of Bronislaw Malinowski (Tom Courtenay, The Golden Compass) on the Trobriand Islands. Malinowski, the father of modern anthropology, brought to the forefront the concepts of “participant observation” and “field work.” Here, he even gets to chat with young Indy about pursuing dreams and the value to time. History continues to reveal itself through Indy’s travels as he reunites with Lawrence of Arabia for the world-altering treaty discussions in 1919 Paris before returning Stateside. Back home, Indy faces segregation issues in New Jersey and suffers through a terribly uncomfortable confrontation with his father. After raised voices fill the Jones household, young Indy takes off to study in Chicago rather than Princeton, much to his father’s annoyance. Once in the Windy City, Indy rooms with a nerdy accountant name Eliot Ness and together they crack a big murder mystery even while Indy gets wrapped up in the blues and jazz. Oh — and this is a MAJOR “oh” — Harrison Ford himself dons the fedora once again, in a bid for higher TV ratings, bookending the Mystery of the Blues episode with an adventure in 1950 Wyoming that calls to mind his early days playing the saxophone and hearing the likes of Louis Armstrong. Having gotten the music bug, Indy whisks off to New York City, where Broadway and Harlem overflow with different musical inspirations and aspirations. Indy is once again allowed to lighten up as he romances three lovely young ladies at the same time and takes lunch at the Algonquin with Dorothy Parker, Alexander Woolcott, and the whole feisty gang of New York wits. Since this is Young Indiana Jones, he also gets to have George Gershwin and Irving Berlin put his romantic woes to music (“... a pretty girl is a melody that haunts you night and day...”) and, in a very nice touch, Rhapsody in Blue is referenced as a symphony in car horns. The Young Indiana Jones Chronicles wind up with Indy taking a school break in Hollywood. As the episode entitled Hollywood Follies unfolds, some delicious film history takes place. While Ford joked about Indiana naming himself after his dog, it’s revealed Ford, the son of Irish immigrants, changed his last name from Feeney and renamed himself after the car. As Indy works his way through the studio system, the giddy spontaneity of Ford’s approach to filmmaking is countered by the laborious, ponderous excess of Von Stroheim. In one of those extremely rare cases where Indy is actually unable to live up to the challenge before him, in this case putting the reins on Von Stroheim’s latest out of control production, Irving Thalberg is brought in to pick up the pieces. Decades later, film fans, both George Lucas and Steven Spielberg would go on to receive the highly-coveted Irving Thalberg Award from the Academy of Motion Picture Arts and Sciences. Fired from the Von Stroheim picture, Indy enlists to help Ford on his latest movie and, at the last minute Indy’s recruited as an impromptu stunt man. The trick he pulls off is none other than the legendary stunt by Yakima Canutt which would resurface in 1981 during the wildly impressive truck chase in Raiders of the Lost Ark. What a way to close out this staggeringly thorough trip through history! After finishing his work with Ford (John, not Harrison), Indy returns to Chicago, continues his studies and, well, the rest turns into its own — modern — film history. As with the previous two volumes, the supplemental documentaries here are nothing short of astounding. (Check out the full rundown of features on the sidebar.) At the risk of sounding like a broken record, George Lucas has really put together a monumental piece of work here. The docs on this set are buoyed by some really intriguing interviewees, including Colin Powell, Henry Kissinger, James Earl Jones (who recalls seeing, and being inspired by, Paul Robeson’s live performance), Janet Wallach (author of Desert Queen, a biography of Gertrude Bell), and Max Allan Collins (author of Road to Perdition). When the subjects turn to movies and music, among those contributing comments are John Ford’s grandson, Martin Scorsese, Elvis Mitchell, Leonard Maltin, Glen Ballard, and Diane Warren. With somewhere around 26 hours of total content to experience, between the Indy episodes and documentaries, this is once again a case of going where the interests lie. That said, Bronislaw Malinowski — God Professor is a virtual must watch, as are Lowell Thomas — American Storyteller; The Best Intentions — The Paris Peace Conference and the Treaty of Versailles; Gertrude Bell — Iraq’s Uncrowned Queen; and Wonderful Nonsense — The Algonquin Round Table. Others worth a particularly special mention are The Secret Life of Edith Wharton; Ho Chi Minh — The Price of Freedom; Dracula — Fact and Fiction; and Erich von Stroheim — The Profligate Genius. Purely relatively speaking, given the incredible quality of the content in these documentaries, the one “stinker” in the batch would be Anthropology — Looking at the Human Condition. It attempts to bring anthropology current, interviewing people who study such cultural phenomena as low riders (and cruising, perhaps a hangover from Lucas’ American Graffiti), donuts, and Pokemon. While the idea is appreciated, history and culture are, after all, happening around us every day, it still pales in comparison to the more historically-centered documentaries. Somewhat surprisingly, there is no tie-in here to Indiana Jones and the Kingdom of the Crystal Skull, the forthcoming big screen adventure, nor are there any documentaries or retrospectives about the making of The Young Indiana Jones Chronicles. While the latter is a little disappointing, there is simply too much greatness here to yip about this exclusion. Also on tap is another lecture from quirky H.W. Brands, Professor of History at the University of Texas at Austin. This time he moves from Versailles and Prohibition to the rise of Hitler; his lecture serves as a sort of bridge to Indy’s feature films and it’s well worth a look. Also found on Disc 10, along with Brand’s lecture, is the same journal and timeline included on the previous two volumes and yet another DVD-ROM game. This game, called Hunting for Treasure, is based on Treasure of the Peacock’s Eye and features the same blend of simple target practice action and trivia found in the games on the previous volumes. Once again, it’s best left to the youngest of wannabe-archaeologists. The intermittent framing problem that popped up on Volume Two is back and is at its most jarring during Hollywood Follies. While it is terribly obvious on a widescreen set, the issue might not be as obnoxious on a standard TV. That problem notwithstanding, the picture quality itself remains consistently pristine. As with the previous two volumes, the audio is well done in stereo. But the same gripe applies once again: surely George could have remastered the soundtrack to full-blown 5.1 surround. The set also offers optional English subtitles. As before, follow young Indy’s adventures and, as your interests dictate, check out the related historical documentaries. They are, across the board, time well spent.